Shift to living a body-centered life. Learn to live every day more grounded, focused & present. Relate more fully to yourself, loved ones & community. 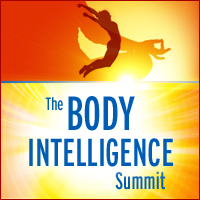 Have more access to your innate energy, vitality & intuition. Cultivate a sense of deep nourishment. Feel less tension in your body. Be able to make decisions clearly & quickly. Set yourself up to have a truly joyful life. The bottom line here is that the more you honor living in your body, the more all aspects of your life will flow with ease. Will the talks they offer live up to this promise? Well, I think it’s definitely worth checking for yourself ! So, once again register to tune into couple of talks each day and receive free goodies upon registering by going HERE, and check the entire programme HERE1. p.s. For the time being – please follow me on facebook, as during being occupied with tuning into the summits – I appear to be much more active there than on blog – and tend to post everyday short messages, sharing links, information, quotations with the capacity to “change one’s life” ( hopefully 😉 ) that are of value to me and I think/hope may bring something meaningful to the table of our Collective Evolution of Humanity. With passion for learning and knowledge!